From a lecture given in 1912 in Mold by Frank Simpson FSA, subsequently reprinted. 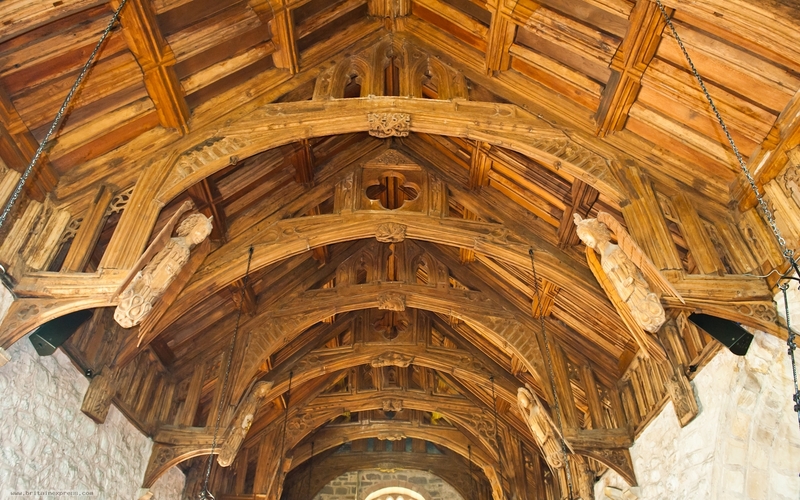 The beautiful carved oak roof of the south aisle is one of the finest in the Principality. 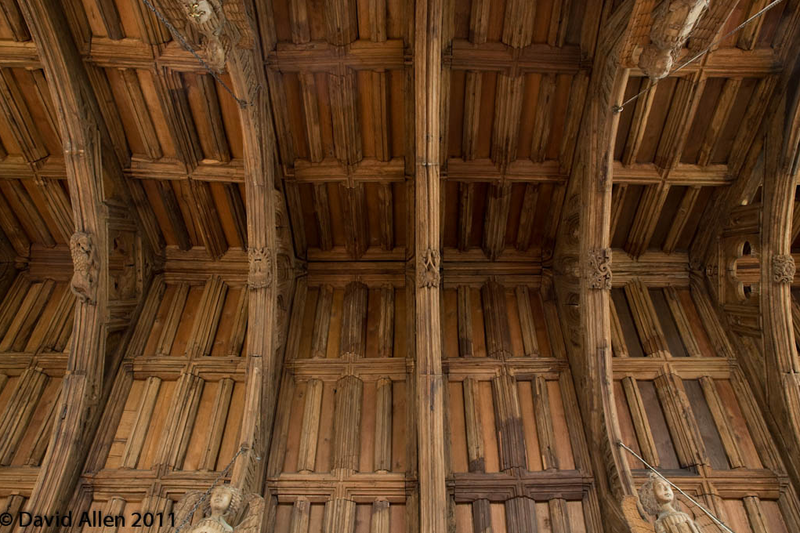 The Chester roof was not specially constructed for its present position, and was used for a longer building, as is shown by the fact that the principal beams at the east and the west are elaborately carved on the inner surface next the chancel and tower arches. There is no doubt whatever that the roof of the Cilcain nave was brought from elsewhere, and where so likely as the disused Abbey buildings not far away ? In most of the old churches in the neighbourhood may be seen articles of one form or another, which formerly belonged to one or other of the Abbeys. The placing of this roof at Cilcain fulfilled a prophecy of Robin Ddu-that is, Robin the Black-who, when he first saw it put up by the monks, observed that it would do very well for a church below Moel Fammau; i.e., that of Cilcain. The roof is divided into ten bays, or compartments, by principals. 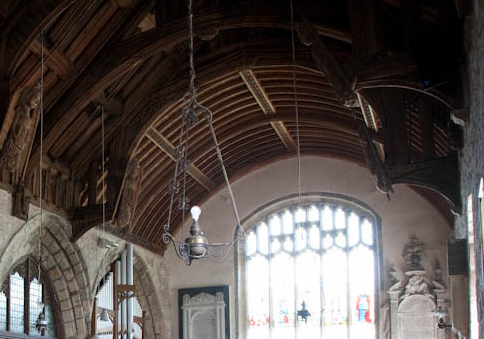 The two bays over the chancel are segmental, almost semi-circular, with a carved wall plate and beautifully moulded rafters, purlins, ridge, and heavily-moulded principal. The panels between the rafters, from the east wall to the communion rails, are decorated with the fleur-de-lys, an evidence of the dedication to St. Mary. The remaining eight bays are divided alternately by five hammer-beam and four collar-beam principals of an elaborate and ornate character. The former are of similar design, except that the gracefully carved brackets to the tie- beams are different in detail in two of the principals. 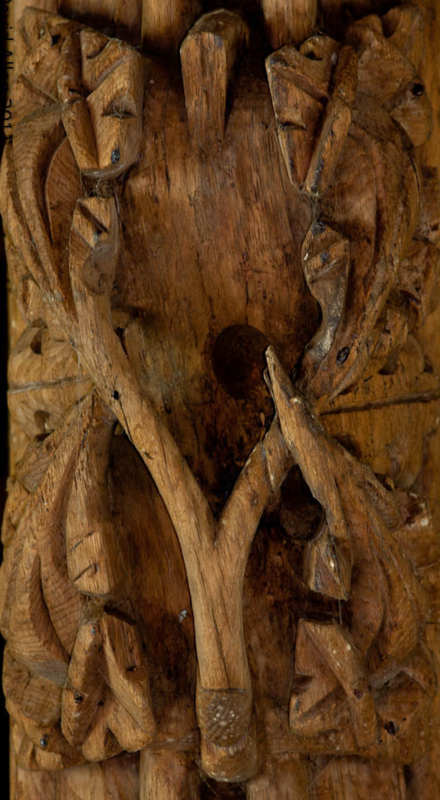 The brackets in these have ornamental panels with trefoil heads, though even here there is a slight difference of detail, as the third from the west end has seven panels on each side, and the fourth has only six. 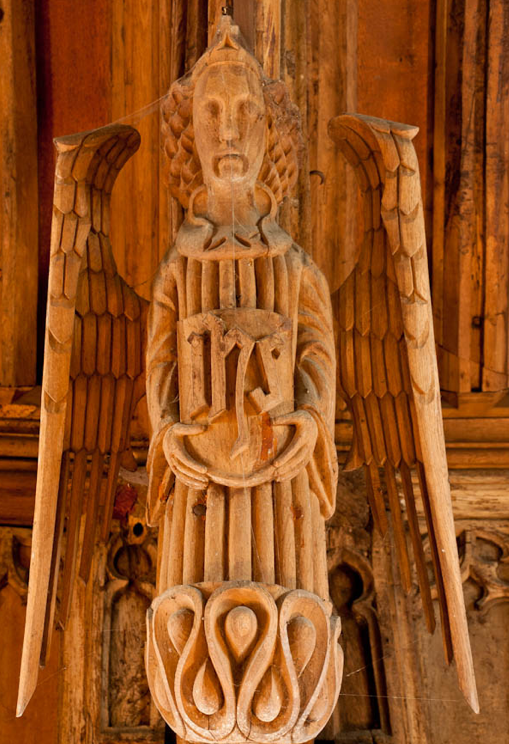 Each of these hammer-beam principals, with the exception of the one nearest the west wall, is terminated with a large carved seraph with semi-closed wings. The two western seraphs, one on either side, are modern. The story goes that an old parish clerk, with more appreciation of strong ale than fine art, sold the missing angels for a quart of beer. 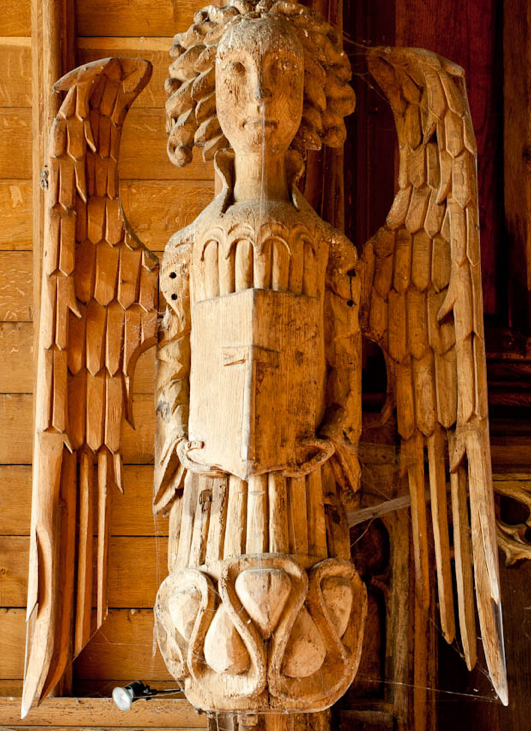 These angel terminals to the hammer-beams are not uncommon in Wales; somewhat similar decorations may be seen in the 15th century timber roof of Llanrhiadr Church; also in the timber roof of the nave of Llangollen Church. In the latter the seraphs have long trumpets in their hands, which they appear to be playing. This roof was originally at Valle Crucis Abbey, but was removed to Llangollen after the Dissolution. The hammer-beam principal nearest the east end, on the north side, is fitted into the outer splay of the arch, which has evidently been cut to receive it. This principal appears to have been considerably restored at some time-probably in 1843, when the whole roof was repaired-as the hammer-beams are of plain oak, rudely shaped to receive the moulded framed corbels underneath. The second hammer-beam principal from the east end is fixed almost into the centre of the arch, a little to the east side, and the arch has been cut away for this purpose. The third hammer-beam principal is further away from the centre of the arch than either of the former, and rests on a corbel immediately above the arch. The hammer-beam principal nearest the west end is carved on its outside face,” and fixed within one foot of the wall, thus forming conclusive evidence that the roof was brought to Cilcain from elsewhere. It is terminated by two modern shields, placed there in 1888, instead of the seraphs as in the others. The shield on the north side bears the arms of the Buddicom family-eg., Argent a chevron, engrailed, between two crosses pattee in chief, and a demi griffin couped in base, gules; on a chief of the last, three escallops of the first. signifying the initials of the late William Barber Buddicom and his widow, and the date when the church was restored at their sole cost. The eight seraphs which terminate the remaining four hammer-beams bear each a shield on which are displayed the Cross and other emblems of the Crucifixion. 2. On a plain shield, three nails Or. 3. On a plain shield, a pair of pincers Or. 4. On a plain shield, a double fleur-de-lys Or. 1. On a shield gules, a hammer Or. 2. On a plain shield, a cross with nail-holes Or. 3. On a plain shield, a double fleur-de-lys Or. 4. On a plain shield, the Sacred Monogram Or. The alternating collar-beam principals, which are four in number, are finely moulded, and terminate at each end in a wall-plate carved in high relief, no two of which bear the same subject. First, a grotesque head with upright pointed ears. Across the forehead, immediately behind the ears, is what may best be described as a serrated band, out of which rise three objects which may represent feathers. The second is also a grotesque head with ears similar to those just described. It displays a row of large teeth, and from below the chin falls a mass of long shaggy hair. The head is represented as supporting the bases and parts of two shafts, or pillars. The third represents two figures kneeling, one on either side of a pillar. The one on the right wears a close-fitting head-dress, and has a long beard. He is clothed in a pleated jerkin, which falls just short of the knees, and is confined round the waist by a broad belt.12 His left hand rests on the shaft of the pillar. The figure on the left, in addition to a long beard, has a prominent moustache, and hair which reaches to the waist. He wears a low-crowned hat, round which is fastened a broad band with streamers descending to the small of his back. His jerkin and belt are similar to those of the other figure. His right hand rests on the shaft of the pillar. 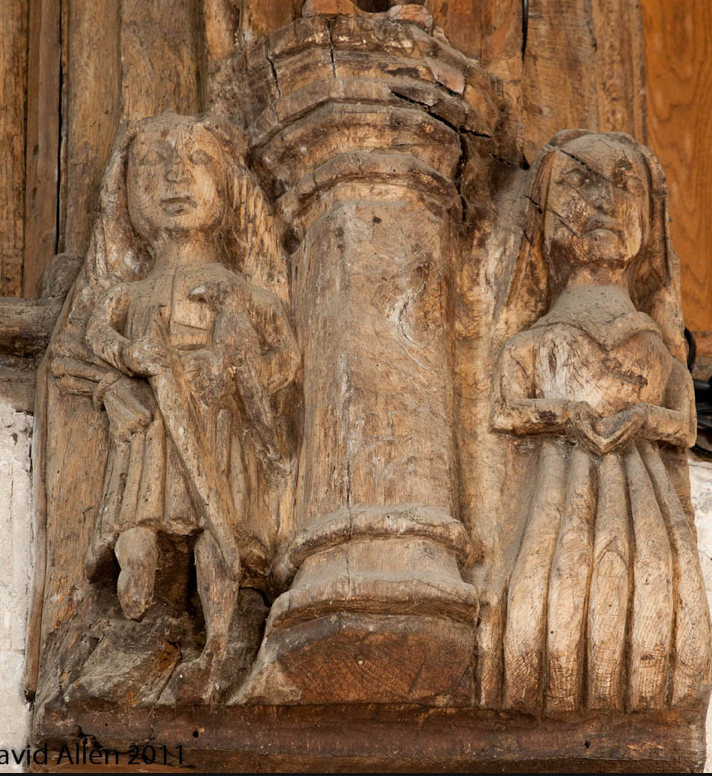 The fourth also consists of a figure on either side of a pillar, but in this case we find a man and a woman, the latter standing on the right of the pillar, and the former on the left. The lady’s head is draped with a coverchief, the throat and chest are covered by a gorget, while her hands are folded upon her stomacher. An effigy of Thomas Bokenham, in St. Stephen’s Church, Norwich, bears a similar belt and jerkin. The date of this effigy is 1460. On the south side, the wall-plate nearest the east end presents a grotesque head somewhat resembling the one immediately opposite, but in this case the ears are small and rounded. On the head rests a crown, similar in design to the one illustrated in Vol. I., Plate VI. (No. 16) of Planches “Cyclopaedia of Costume (Chatto & Windus, 1876), which he states to be the Crown of Edward III. The forehead is divided in the centre by a kind of spiral ornament which descends to the bridge of the nose. 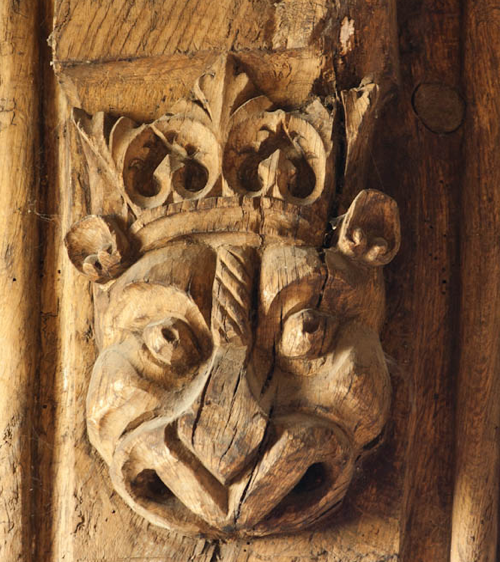 Before passing on, it is worth noticing that the head on the wall-plate at the other extremity of this same beam is surmounted by a coronet-like band, from which spring three ornaments like feathers. Taking in conjunction the nature of the adornments of these two heads, is it possible that they were intended to caricature Edward III. and the Black Prince, who was also Prince of Wales? The second figure is similar to the one opposite it, but shows no teeth. 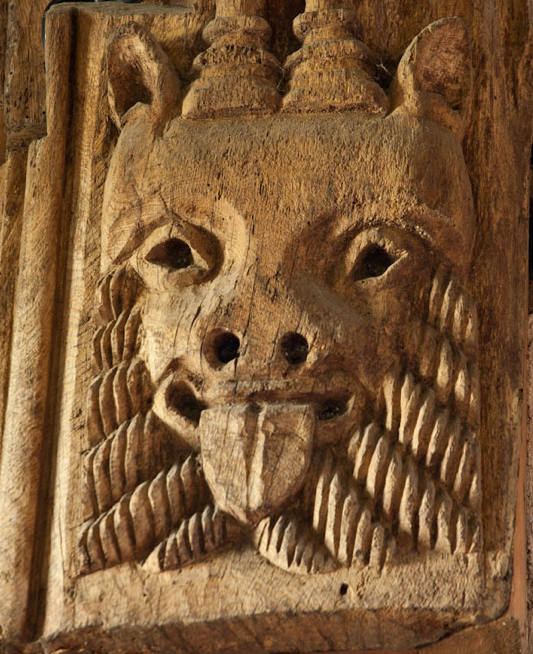 It has a long protruding tongue, the centre line of which is deeply carved. 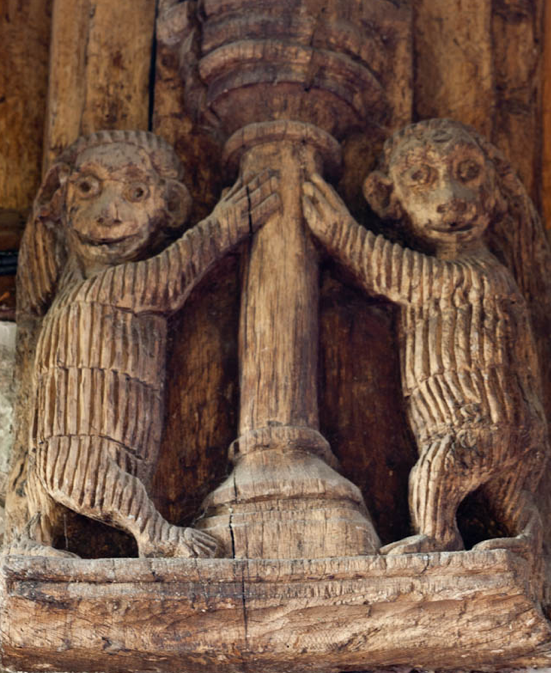 The third consists of what appear to be two apes standing on their hind legs, one on either side of a pillar. Both have hair which grows in a fringe low on the forehead and falls at the back upon the shoulders. The bodies and limbs of both are carved in such a manner as to suggest a thick coat of hair. 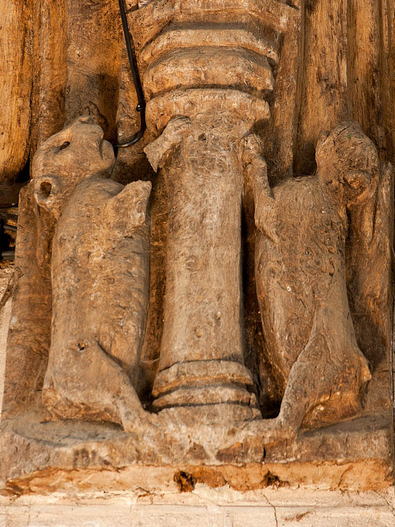 The right hand of the figure on the left rests upon the pillar, as does the left hand of the other figure. The fourth and westernmost wall-plate represents two animals-more like rabbits than anything else- sitting on their haunches, the position of their fore- feet corresponding to that last described. The rafters are all finely moulded, and throughout the whole length of the roof are supported by the hammer-beam principals. 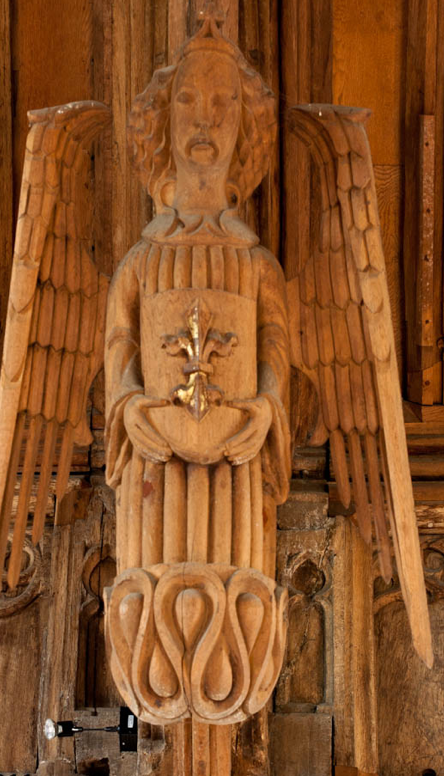 Just above the wall-plate, on either side of the south aisle, it is panelled with moulded ribs and traceried heads, no two of which are exactly alike. In the centre of each of the nine hammer-beams is a carved boss. 9. Grotesque head, showing teeth. In the belfry were, at one time, a few beams with heads or other carvings on the corbels, similar to those in the roof of the Church. These unused beams support the tradition that a greater number of roof beams were taken from the Abbey than were required for the Church, and that the surplus timber was stored away in the tower. The caretaker in charge of the Church, whose family have held this position for several generations, in- formed me that the surplus timber was in the tower in 1873 it was not there when I first visited the belfry in 1900, therefore it may have disappeared during the restoration of 1888. The Ven. the Archdeacon of Chester, when delivering a lecture, March 19th, 1901, in the Grosvenor Museum, on The Roof of St. Mary’s-on-the-HilI, Chester, stated We know that there is a tradition that the roof of Cilcain Church, near Mold, came from Basingwerke; but this may have been taken from the refectory or some other portion of the Abbey. It is, I am told, an interesting specimen of the double hammer-beam pattern; and evidently, from the position of the principals, was not made for that Church. 14 A hobbit, or hobit, is a local measure peculiar to North Wales. A hobit of wheat weighs 168 lbs. of beans 180 lbs. of barley 147 lbs. of oats 105 lbs. of potatoes 210 lbs. when getting up, but in winter 200 lbs. and six pecks to the hobit being 21 bushels imperial. — Morton Cyelo. Agric.” (1863). Farm produce is still bought by the hobit in Flintshire, but for builders material the measure has ceased to be used. It has been suggested that the Cilcain roof was formerly that of the Refectory of the Abbey, which was stated to be 67 feet long and 28 feet wide; although it may perhaps originally have been 80 feet long. The Cilcain nave roof is 54 feet 4 inches in length, and extends beyond the chancel step 4 feet 3 inches; it is 22 feet 6 inches in width. The main compart- ments, of which there are four, vary from 14 feet 7 inches down to 13 feet 3 inches from bracket to bracket. 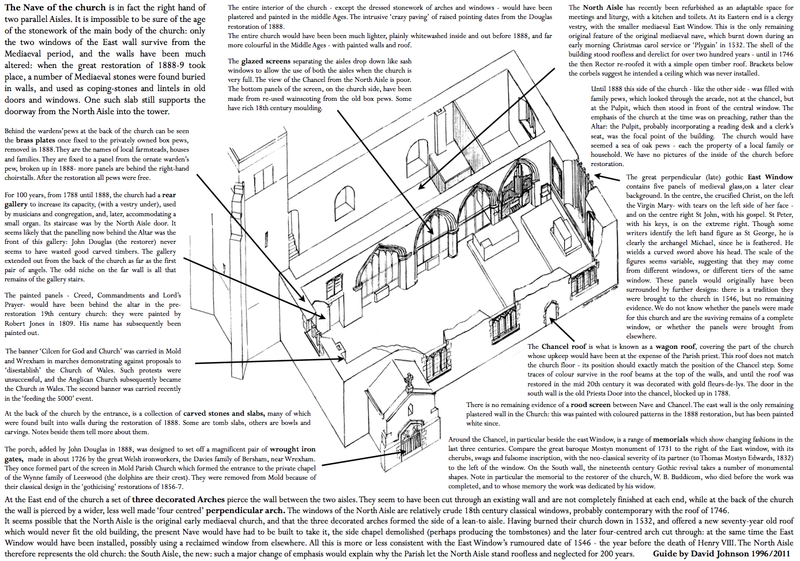 The part over the chancel, which, as before stated, is of different design, is 17 feet 71 inches long to the first hammer-beam 22 feet 7 inches wide, and 7 feet 11 inches from the wall-plate to the centre of the curve. The entire height is 23 feet 4 inches. It seems, therefore, hardly probable that this roof could have formerly been that of the Refectory at Basingwerk. Much speculation has taken place as to when this roof (of the south aisle) and that of St. Mary’s-on- the-Hill, Chester, were erected at the Abbey. After careful research, extending over a period of several years, I venture to think that there is little doubt that both roofs were erected during the abbacy of Thomas Ap Dafydd Pennant, about 1450-70. In 1843 Cilcain roof was in such a bad state that it was found imperative to undertake an early examination and thorough restoration as soon as possible. After several meetings of the parishioners and others interested in this beautiful roof had been held, a sub- scription list was opened and donations were received by Mr. Molineux, the manager of the Mold Branch of the National and Provincial Bank of England. Mr. Llewellyn F. Lloyd, of Nannerch, a large landed proprietor in the district, interested himself deeply in the scheme, and, in order that the work might be proceeded with at once, guaranteed the whole cost of the work, which amounted to £ 5ï8 4s. Ilid. It was chiefly through the exertion of this gentleman that the work was completed. Colonel M. Williams, another local landowner, gener- ously headed the subscription list with a donation of £ 5°, A complete balance sheet of the fund appears in the Churchwardens’ Account Book of the time. The services of Mr. Ambrose Poynter, F.S.A.,19 Secretary of the Royal Institute of British Architects, were requisitioned, who in 1845 undertook the restoration, which he completed in a most scientific and successful manner without removing the main structure. “Previous to the late repair, the roof of Cilcain Church was in a state which threatened immediate ruin. The principle of its construction, as of many of the church roofs of the Middle Ages, was that of the collar beam united by knees to the principal rafters, the horizontal tie being placed so high as to oppose, in the absence of any other connection between the timbers but mortices and wooden pins, very little resist- ance to the tendency of such roofs to spread at the feet of the rafters and the purlins and small rafters being tenanted to the principals, and to each other in short lengths, there was as little to prevent the whole structure from racking longi- tudinally by the action of the wind. Hence the failure of pins, which had occurred more or less throughout, partly from the strain on them induced by these causes, had produced a general dislocation of the parts. The joints between the timbers were generally open, many of the tenons drawn out of the mortices, and in some places the knees and the rafters were separated by a space of three or four inches. Many of the timbers were also in a rotten condition, and the tenons absolutely gone; so that nothing but the application of iron straps had held them in their places. “This was made by Edwd. Near the south-west door, on a stone shelf raised 16 inches from the floor, are remains of an early Norman font, remarkable for the interlaced ornamentation of its exterior and the conical form of its interior. This was found in 1845, buried in the ground about three feet below the surface, under the pulpit near the south wall. Mr. J. O. Westwood, when writing about this font in 1846, says:- “It is much the worse for the bad usage it has been subjected to; but when entire formed a square basin in its upper part, the external measure of which is about eighteen inches. The lower part of the basin has the angles cut off, so as to form an octagon, standing upon an octagonal base not quite so large as the rectangular upper part. I have nowhere met with such a curiously formed font in my ecclesiological rambles, nor is there such a shaped one represented in Vanvoorst’s work on fonts. The interior forms an obconical basin, having a small circular hole at the base for the discharge of water. I believe, therefore, that in this respect the font is also remarkable, as it is, thirdly, in the character of the ornamentation of the exterior surface. This, when the font was entire, consisted of twelve groups of trifoliations at the top, the lower part composed of five lines variously disposed, so as to form festoons and angulated patterns quite unlike anything I have ever met with either in stonework or MSS., with the single exception of the font in the dilapidated Church of Llanidan, in Anglesey. This pattern, it will be seen, partakes in no way of the Gothic style of ornament, but rather approximates to the Norman, so that we shall perhaps be not far wrong in assigning the twelfth century as its date. It is to be hoped that it will be repaired and placed in the church instead of the present font, which is destitute of architectural character.” Mr. Westwood here alludes to the font in the church prior to the restoration, which was replaced at that time by the present one. Mr. Westwood gives the size of the old font as i foot 6 inches across the top; it actually measures 161 inches square, and is 12 inches in height. The error has probably arisen through the author having written in his notes 16 inches, and afterwards when writing his account mistaking the size for i foot 6 inches. 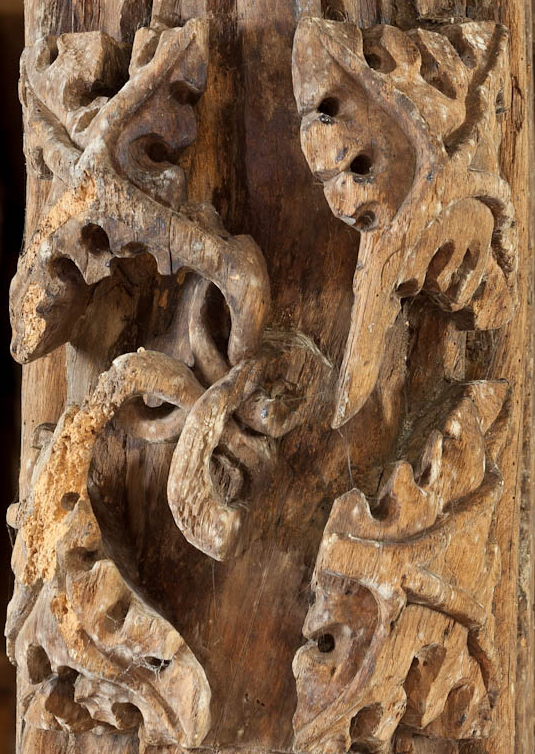 There is also a finely-carved corbel, and part of an old stone stoup, or vessel for holding holy water. The latter is said to have been brought from Basingwerk Abbey. It is three-cornered in shape, 9 inches high, and measures 12 inches on the right side and 14 inches on the other side. There are also several 14th century stone coffin-lids with various designs and inscriptions. These, with the exception of one which formed the lintel of the doorway to the old vestry, and another used as a coping-stone on the north side of the church, were removed from the south wall of the church during the restoration of 1888. At one time they were scattered about in various places. 1.This inscribed and ornamented coffin-lid, from which the head has been broken off, bears the bust of a man with the left hand across the breast; the hand grasping a stick in a perpendicular position, the right arm hanging down. On the right side of the lower part of the stone are a few Lombardic letters. This, prior to the 1888 restoration, was used as a coping stone on the north gable. The size of the remains are 1 1 inches wide at the top, 6 inches at the bottom, and 21 inches in length. 2. Another coffin-lid, decorated with a rude incised cross; the head a plain circle enclosing eight pointed leaves in a wheel-like pattern. The stem, part of which is gone, consisted of two simple lines. This measures 9 inches across the head, 8 inches across the lower part, and is 141 inches in height. 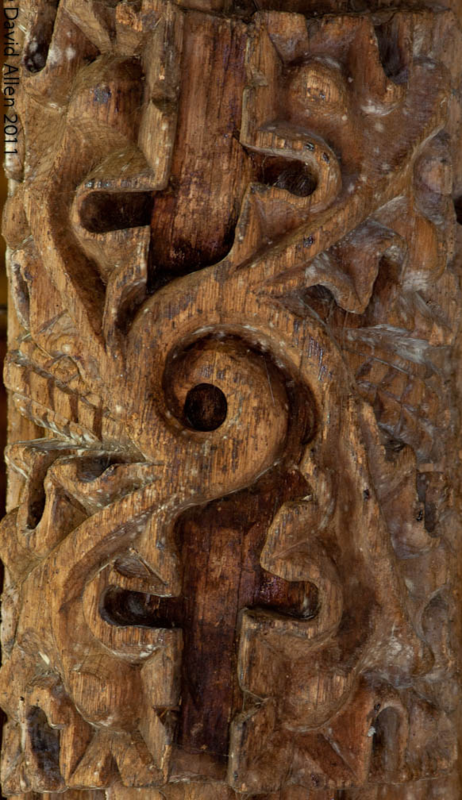 This is probably the oldest of the coffin-lids now seen in the church. 3. A stone coffin-lid, from which part of the head has been broken off; bears in the upper part the bust of a man, with the hands crossed on the breast. On three sides of the lower portion, in a border 21 inches wide, is inscribed:- “X HIC IACET MARREDT IERWERTH. The stone, which has been broken in two, measures 12 inches across the head, gi inches across the foot, and 2 feet 9 inches in length. 4. Another sculptured stone, with part of an inscrip- tion down the centre, bears the effigy, in low relief, of a female in a rude style of art. 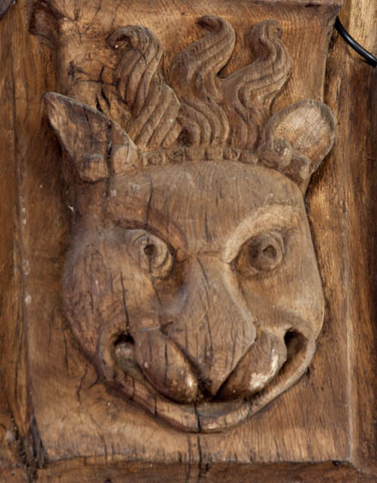 This was formerly placed, with the face downwards, as the lintel of the doorway to the old vestry under the gallery. It measures 2 feet lot inches in length, and I foot in width, but has originally been much longer and wider. 5. Head of a coffin-lid, ornamented with a cross fleury of quatrefoil design, interlaced with four curves somewhat resembling horseshoes. In the centre a flower. The part containing the shaft of the cross is missing. It measures 2 feet 4 inches in length, and I foot 5 inches in breadth. It is said to have been in the Rectory garden in 1845, and Archdeacon Thomas, writing in 1872, states it was there at that time. 6. A 14th century stone, mutilated and made use of as a lintel, with the face downwards, over the doorway leading from the north aisle to the base of the tower. In the centre of the stone is the stem of a cross, with rectangular base; and crossing from the upper left corner to the lower right corner is a broad, naked sword. Along the right side is part of an inscription in Lombardic lettering, now so clogged up with whitewash as to be almost indecipherable; but the following can still be seen:- “MAREDIT AP BLEDYHN.” The centre portion is filled with floral ornamentation. In the Vestry Book is the following:- 1791-2, For Cutting Wall & Setting 2 Doors in the Steeple by Agreement 18 o” It is, therefore, only reasonable to presume that this coffin-lid was cut and used as a lintel at that time. The second door was above the one just mentioned, on a level with the first storey in the belfry. For what use it was intended it is hard to say, unless as a kind of squint for the ringers. This is now blocked up with masonry, but in the belfry the lintel and position of the door is clearly seen. There is also a fragment of another tombstone, 12 inches by 91 inches, bearing an incised floral design. “Chester Archaeological Journal” (N.S. ), vol. VIII., pp. 78-9. Cilcain Church is in the Diocese of St Asaph, in the community of Cilcain in the county of Flintshire. It is located at Ordnance Survey national grid reference SJ1763865160. The church is recorded in the CPAT Historic Environment Record as number 16747 and this number should be quoted in all correspondence. St Mary’s church occupies a sub-circular churchyard on the western edge of Cilcain village and is a double-naved structure with a western tower. Parts of the northern nave have been attributed to the 12th or 13thC, but most of the church including the tower is 15thC. The south nave has a spectacular Perpendicular hammerbeam roof, traditionally thought to have come from Basingwerk Abbey. There is a fragmentary font, perhaps of Norman origin, some broken 14thC sepulchral slabs, and a small amount of 16thC stained glass. The north nave is now partitioned off and used only as a vestry. Original stone church of 13thC or even 12thC, but how much of this survives is unclear for the masonry phases are difficult to unravel. The tower and aisles are all in variations of the same masonry, but it is generally considered that, internally, part of the south wall of the north nave is original. Thus the north nave is supposed to be the earliest but it was certainly improved with Perpendicular fenestration before being damaged by fire in 1532. Rebuilt but to a unknown degree in 1746. The south nave is said to have been added in the 15thC, presumably replacing an earlier aisle. Bottom portion of the tower is considered to be 15thC, but a round-headed doorway inserted in the ?18thC, and the belfry windows and battlements added in the 19thC. An early medieval origin is suggested by the morphology of the churchyard and perhaps the location. The church does not seem to have been recorded in the Norwich Taxation of 1254, but it is documented in the Lincoln Taxation of 1291 as ‘Ecclia de Kylkeyn’ at a value of œ11 1s 8d. Some of that 13thC building survives in the present north nave but there was a building programme in the 15thC which saw the addition of the south nave and the tower. The north aisle was burnt down in 1532. It was rebuilt in 1746 at the personal expense of the Rev Davies, having stood without a roof for over 200 years. It has been suggested that repairs to the roof in 1786-7, which included reslating, provided the opportunity for replacing an early roof with the carved and ornate timbers from Basingwerk Abbey, but there is no substantive evidence for this derivation though there can be little doubt that the roof was not originally designed for this church. At this time, too, a gallery may have been constructed at the west end of the south nave. Access was presumably by a staircase leading from the present alcove on the west side of the internal doorway that leads to the north aisle. The present reredos may have been fashioned from the front of the gallery. The priest’s door on the south side of the church was blocked at this time. Restoration work by Ambrose Poynter took place in 1845/6, and included work on the nave roof which was described in detail, as were other discoveries, in ‘Archaeologia Cambrensis’ in the following year. Glynne visited Cilcain at an unknown date in the 19thC. He implies that the tower was largely brick-built but may be referring to the upper stage. Noted briefly are the rebuilding of the north wall, the Perpendicular east window and the arcade with its differing pillars. The tradition that the south nave roof came from Basingwerk is reiterated. More substantial restoration was undertaken by John Douglas in 1888-9. This included removing the plaster from the inner wall faces, screening off the nave from the north aisle, reflooring the sanctuary and the south nave and replacing the pews. The south porch was rebuilt and fitted with iron gates and two diagonal buttresses were added to the tower. The brickwork on the top of the tower was replaced by stone and a new window was inserted into the west face. Windows were renewed on the east, west and south sides. The organ loft and west gallery were removed and the east end of the north aisle was partitioned off to form a vestry which included the organ. The churchyard was levelled around the church where necessary, and soil was removed from the church floor to accommodate a cellar for the heating apparatus at the west end of the north aisle. The church was restored at the expense of William Barber Buddicom, a railway engineer of Penbedw Hall, near Nannerch. He died before the restoration was complete and his widow carried on the work in his memory. In 1935-37 repairs to the roof were carried out by F.H. Crossley. The church consists of a double nave, though the north side is often termed a north aisle, a west tower at the west end of the north nave and a south porch. It is oriented north-east to south-west, but ‘ecclesiastical east’ is adopted here for descriptive purposes. Fabrics: ‘A’ comprises irregular lumps of grey sedimentary stone (perhaps a siltstone), some limestone blocks, some buff coloured sandstone and some pebblestones; randomly cursed, rough appearance and much weathered. ‘B’ is similar to ‘A’ but contains red sandstone blocks in addition. It is not clear whether ‘B’ is simply a variation on ‘A’ or a fabric in its own right. ‘C’ consists of regular blocks and slabs of limestone, medium in size; some coursing. Roofs:- slate roofs with black ceramic ridge tiles over the north aisle and porch, red over the nave. Drainage:- renewed guttering and downspouts lead to soakaways. A concrete drainage channel runs the length of the north wall. Tower – General. A squat tower. Lower courses in fabric ‘A’, and battered to a height of c.1m. Then a weathered string course c.2m above ground level, and an upper string course below the belfry; the upper part of the tower is in ‘B’ but the belfry string course marks the change to ‘C’. Another string course with a cavetto soffit and then a battlemented parapet in ashlar surmounted by four corner pinnacles in buff coloured sandstone. Stepped diagonal buttresses in ‘C’ at western corners, added with the battlements during the 1888 restoration work, and a clasping buttress to the north-east angle. The tower is topped by a low pyramidal roof with a weathercock. North wall:- doorway with round-headed arch, the jambs and voussoirs in limestone, and clearly inserted into the ‘A’ masonry. The lowest string course is broken and above this ‘A’ gives way to ‘B’. Immediately below the belfry window the wall is rebuilt in ‘C’, a wedge of this masonry tapering down to a point. The belfry window has a square-headed frame, and the arch is four-centred with a wide, cusped, ogee-headed light below, all in red sandstone. Plain waterspout from the battlements. East wall:- aisle roof rises to about half the height of the tower. Just below the second string course is a flat-headed slit window with dressings of buff-yellow colour. Belfry window of standard form except that it has two louvred lights. South wall:- lower courses in ‘A’ but sandstone slabs tend to blur the distinction between ‘A’ and ‘B’. The lowest string course broken and above this is a broad slit window, its jambs mainly of limestone and with rendered edges. Masonry in this part of the wall more ‘A’ than ‘B’. Standard belfry window with two lights; battlements etc, and again the wall rebuilt in ‘C’ immediately below the window. West wall:- heavily covered in ivy and some remnant render/limewash. Appears to be mainly ‘A’ with ‘C’ high up. The belfry window has a single light. North aisle – General. The original nave, but narrower and lower than the present nave and chancel. Of 13thC origin but reportedly rebuilt in 1746. How much was rebuilt it is impossible to determine from the fabric. North wall:– the masonry is ‘B’ type but with limestone predominating. From the west a doorway with moulded jambs and a round-headed arch all in buff-brown sandstone. Two windows of similar design with round-headed arches and east of the more easterly window a chimney rises above the eaves; the windows retain most of their original 18thC glass. At the east angle the wall face is inset indicating complete rebuilding over the last 1m, and the quoins are in the same coloured sandstone as the window dressings. East wall:– the fabric is as the north wall. The east window small in relation to the wall as a whole: a four-centred arch with hoodmould over three cinquefoiled lights with panel tracery above, the panels with trefoiled heads; the jambs have hollow chamfers. 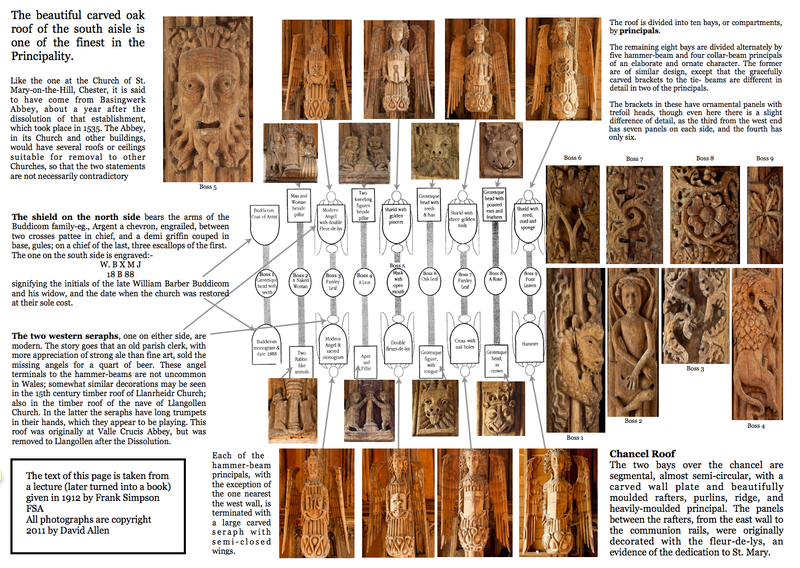 Some original tracery survives though not in good condition; most jamb and archstones renewed. South nave and chancel – General. Not differentiated externally. East wall:- in a variation in ‘A’, but much of the wall hidden by vegetation. Later than the north nave, it has a clear juncture with the latter’s east wall and is outset from it. The Perpendicular east window, larger than its counterpart in the north nave, has five cinquefoiled lights and panel tracery. under a four-centred arch with a hoodmould and weathered stops. Some of the jambstones and perhaps some of the tracery are original. Higher up in the gable are two holes of regular circular shape. Quoins at south-east angle are in red and yellow sandstone below and limestone above; only the yellow sandstone is original. South wall:– masonry is as in the east wall but there is patching to the wall face which stands out. The features from the east are: i) a square-headed window in red sandstone; the four cusped lights are divided into pairs, each pair under a round-headed arch. Similarities with the belfry windows and dating from the restoration of 1888/9. Above this window regular blocks of limestone show the rebuilding that accompanied its insertion. ii) a priest’s door with a four-centred arch, now blocked off in limestone; the arch stones in pink limestone, the jambs in buff-yellow and all showing signs of wear. iii) window as i) though it may be fractionally wider. Some re-use of yellow sandstone above and to one side of the window though none of the blocks are obviously dressings. iv) square-headed restoration window with three cusped, two-centred lights, all in uniform pink sandstone, and like the other two windows with a protruding sill of fired clay tiles. v) porch. The south-west angle has quoins which are predominantly of yellow sandstone. West wall:– in a variation of ‘A’. Some evidence at the top that the roof has been raised by around 0.4m, and explains why the window appears slightly off-centre (Note that there is nothing directly comparable at the east end). This window has a basket arch with three cinquefoiled, ogee-headed lights with cusped panel tracery, all 19thC. South porch – General. Added in 1888/9 in ‘C’. East and west walls:– small windows to the same general design as the belfry with broad ogee-heads in pink sandstone. South wall:- a four-centred doorway with moulded jambs and a hoodmould with simple out-turned stops. Below springer level is a zone of ashlar masonry across the front of the wall. Above the doorway a small window, comparable with those in the side walls; a lamp above it. The entrance is closed off by wrought iron gates with gilded decoration. These are of c.1720 manufactured by the Davies family of Bersham and were brought from Mold Church where they formed the entrance to the Wynne chapel, prior to the 1856 restoration. Porch – General. Flagstone floor. East and west apertures in splayed openings. Boarded timber ceiling with simple rafters and purlins. North wall:– four-centred arch to main church in red sandstone; chamfered dressings with double broach stops, 0.7m off the ground; some of the arch stones renewed; sharpening marks on some jambstones. Door itself may be 18thC. East wall:- a wooden First World War memorial. Tower – General. Narrower than the north aisle. A rough concreted floor, roughly rendered; whitewashed walls to a height of 3m which, with a projecting corbel, marks a floor now removed. Now open to the timber floor below the belfry and approached by a ladder. 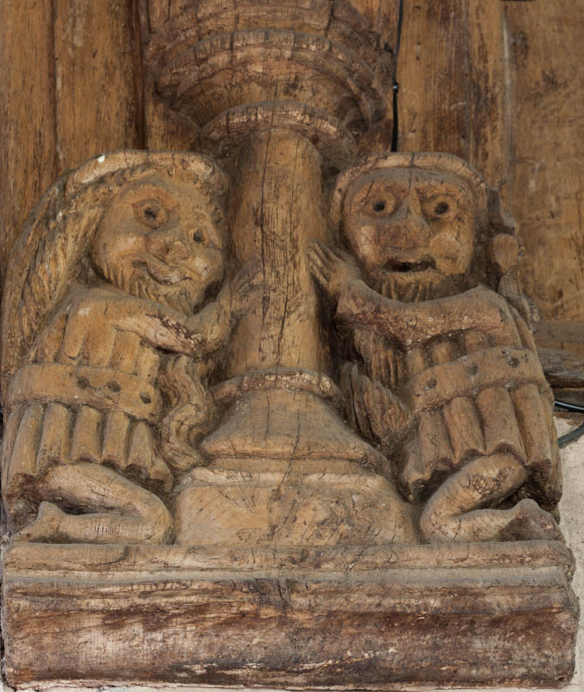 Owen noted that beams in the belfry were supported on corbels with heads and other engravings comparable with those in the nave roof (see below) – these have not been confirmed. North wall:– doorway with segmental head to reveal, approached by one low step. West wall:- one slit window. North aisle – General. The original nave but now used for storage and at the east end a vestry has been partitioned off. Concrete floor with loose carpets, but a vault slab towards the east end. The floor level is below the ground level of the churchyard, and the vestry with its woodblock floor is one step above the general level. A boiler is sunk into the floor at the west end. All stonework exposed, except on the east wall which is partly plastered. The roof has seven bays separated by six arch-braced collars with king and raking struts; through purlins and boarded behind. North wall:- four steps to the disused north door; voussoired arch to its reveal and also to the window reveals. In the north-west angle is a buttress rising to roof level – its significance is not clear (see also west wall below) On the wall a brass recording the rebuilding in 1746 and a benefaction board. East wall:– lower part of the wall plastered. South wall:– at the eastern end is a three-bay arcade in Decorated style with moulded two-centred arches of three orders, on octagonal stone piers with moulded capitals and splayed column bases; in grey sandstone with limewash traces still evident. West of the third bay is a juncture in the masonry indicating a change in the walling and it is believed that the western part of the south wall could be 13thC if not earlier. Cut through this is a cruder and wider bay in Perpendicular style, with a four-centred arch of two orders with plain chamfered responds rather than piers. Immediately to the west is another change in the masonry as a result of this insertion. West of this bay the early walling is broken also by a doorway which provides access from the nave to the north aisle. This has a four-centred arch with chamfered jambs and is presumably 15thC, though its stonework is similar to that of the Decorated bays. The recess to the west side of this connecting door was the site of a staircase to the singers’ gallery which was removed in 1888.The bays of the arcade are now closed off by glazed wooden panelling inserted by Douglas in the 19thC; the lower panelling may have been made from reused pews. West wall:- a narrow square-headed doorway leads to the basement of the tower and is approached by three steps. The doorway is dated to 1746 when the north aisle was restored. North of the door the wall is wider and as with the buttress in the north-west angle this is difficult to explain, though it has been suggested (on uncertain grounds) that it relates to the former gallery. Nave – General. Floor one step below the porch and of flagstones including at least nine graveslabs ranging from 1669 to 1830, and one with an inset brass plate of 1768. Two rows of benches on flush woodblock floors. Walls show bare stonework. Roof of four main bays defined by hammerbeam trusses with arch-braced collars and the tympana above them pierced by cusped apertures. In between are four further arch-braced collars with queen struts and subsidiary collars and quatrefoils between the struts. 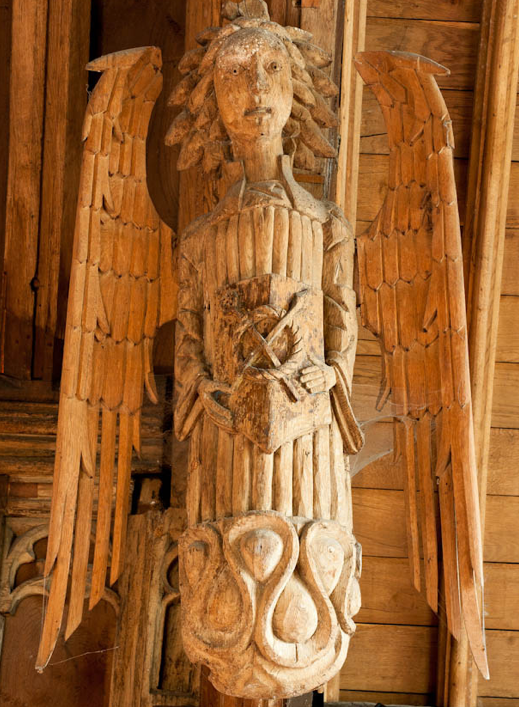 Angels on the hammerbeams carry shields bearing emblems of the Passion, and there are secular carvings and grotesque forms of animals and human figures on the bosses and on the wallplates beneath the arched-braced trusses. All the timberwork is moulded including the purlins and rafters. Above the wallplates is blind arcading with cusped ogee-tracery, showing some signs of replacement. 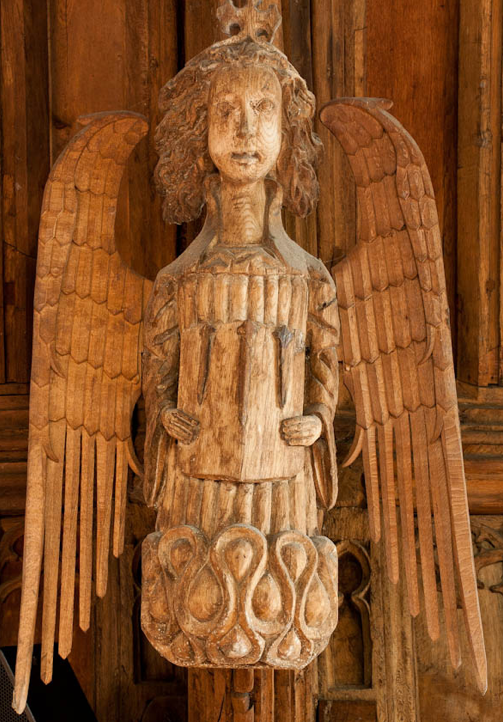 There are no angels on the extreme west hammerbeam – presumably they could not be accommodated against the west wall. The general belief is that the roof was imported from elsewhere for it does not relate to the arcade, the scale implies it should be at a greater height, and the unequal distances at which the principal rafters are fixed suggest that it was made for some other church. Tradition suggests it came from Basingwerk Abbey after the Dissolution, though this has been questioned in recent years. It was repaired and restored in 1846, and one of the westernmost shields bears the inscription ‘WB MJ 1888’. North wall:– arcade as described above under south wall of north aisle. The alcove at the west end has a blind two-centred arch and as noted above is supposed to have related to the gallery. Over the Decorated arches further east is a continuous hoodmould; at the west end it terminates in a head stop, the head a caricature of medieval date, though the hoodmould stone behind it has been replaced. Also on the wall is a Psalm board in Welsh. East wall:– one step up to the chancel. The change in the style of the roof (see below) is not in line with the division, for the last of the hammerbeams is about one metre to the east. South wall: – tracery in most easterly window could be old, the rest replaced. The arches of the reveals consist of long limestone slabs: and there is a general impression that some of the reveals have been rebuilt. The doorway is slightly splayed. One memorial of 1718 in the reveal of the most easterly window. Elsewhere on the wall a First World War brass memorial. West wall:– Decalogue and Psalm boards below the window, and to the south side of the window a corbelled ‘buttress’ rises up the wall and behind the roof, and presumably indicates a chimney. Chancel – General. One step up from the nave, with further steps to the sanctuary and to the altar. The 19thC tiled floor includes two marble slabs to Thomas Hughes (d.1826) and Thomas Mostyn Edwards (d.1832), and encaustic tiles. 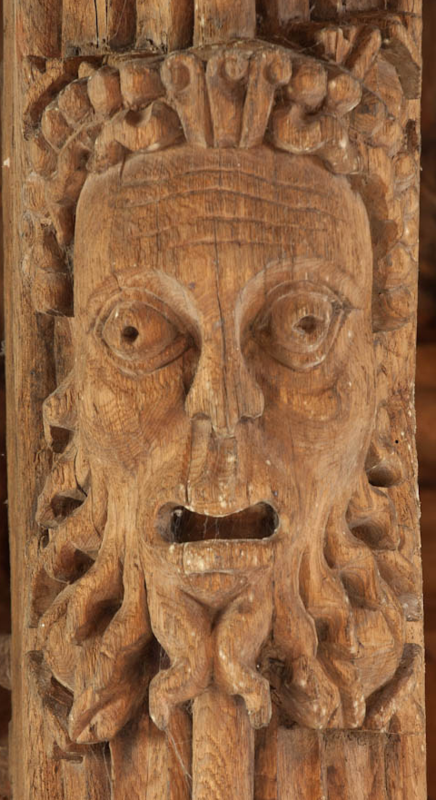 Longitudinal choir stalls with carved fronts rest on herringbone woodblock. The simple wagon roof of two bays is coved with decorated purlins, moulded ribs and quatrefoil tracery. Above the wallplates are friezes of running foliate ornament, and much of this is earlier than the roof itself. Over the sanctuary the panelled background is painted red. North wall:- the easternmost bay of the Decorated arcade is filled with the organ (installed in 1912 by Rushworth and Dreaper to replace a small organ brought from Llandyrnog church in 1888). The hoodmould over the arcade continues from the nave and terminates in a Victorian floriate design of pink sandstone. East wall:- wood-panelled reredos, and the wall above this is plastered and painted. Monuments of 1731 and 1832 on the wall. South wall:– a wooden sedile set in a recess below the south window. A bench with a carved head set against the south wall covers the head of an arched reveal. This is presumed to be the priest’s door, yet the arch is very broad and could be for a tomb recess. Also two 19thC marble memorials and one 19thC brass. The churchyard is a raised oval enclosure. Closed for burials, and a modern cemetery consecrated in 1899 is located on the north side of the village. The ground was levelled around the church during the 1887 restoration and in 1973 work in the churchyard included the removal of headstones and kerbstones. Boundary:- a stone revetment wall, up to 2m high on the north side but less high elsewhere. Repaired in the 1980s. Monuments:– scattered marked graves and areas of graves now laid flat and grassed over, though some upright markers to both north and south. The south path is lined with graves of 18thC and 19thC date laid flat. The car parking area is surrounded by re-sited grave slabs also of 18thC and 19thC date, the earliest noted of 1731. Along the south side of the church slabs laid flat include 1737 and 1739 examples. 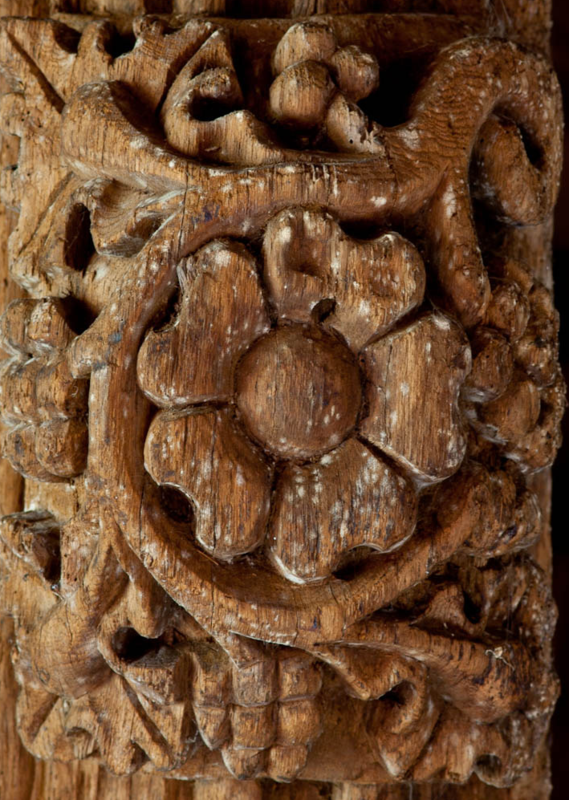 Furniture:- east of the chancel is the stone pillar of the old cross, c.0.3m square; it is octagonal with broach stops at the base, and part of the socket remains. When Owen recorded it in the later part of the 19thC it was on the south side of the church, was reinforced by an iron band and, at over 7 feet, was considerably higher than today. He attributed it to the 14thC. The stone plinth for a sundial, c.1m high and sans plate and gnomon, has a rectangular section and chamfered edges, and is sited to the south of the chancel. Earthworks:- the churchyard is raised up to 1m on the west and the east, 1.5m on the north, and up to 2m on the south. Ancillary features:- the east lychgate has limestone walls c.2.2m high supporting 19thC timber framing over a pair of decorative iron gates. Slit apertures in the side walls and cobblestones set in the entrance. A hearse house of about 1810 adjoins the lychgate. A tarmac path leads up to south porch. There is a single western gate and to the north of it a pair of double gates lead into a car parking area created at the west side of the churchyard. Vegetation:- mature poplars and horse chestnuts overhang the churchyard on the north and west sides. Please note that many rural churches are closed to the public at certain times. It is advisable to check when the church will be open before visiting. Information about access, or how to contact parish clergy, can often be obtained from the relevant Diocesan Office which can be found through the Church in Wales website. Further information about Cilcain Church may also be found on the St Asaph Diocese website. 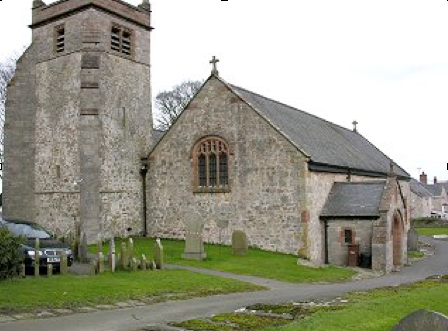 The CPAT Flintshire Churches Survey Project was funded by Cadw as part of an all Wales survey of medieval parish churches. This HTML page has been generated from the Cadw Churches Survey database & CPAT’s Regional Historic Environment Record – 17/07/2007 ( 22:01:53 ). Further information about this and other churches surveyed is available from the Regional Historic Environment Record, Clwyd Powys Archaeological Trust, Curatorial Section, 7a Church Street, Welshpool, Powys, SY21 7DL tel – (01938) 553670, fax – (01938) 552179, email – chrismartin@cpat.org.uk, website – www.cpat.org.uk.